Wright State biology professor Don Cipollini suspects that the emerald ash borer, which is destroying ash trees in a large part of the country, has apparently spread to a different tree. The emerald ash borer, which is destroying ash trees in a large swath of the nation, has apparently spread to a different tree, a researcher at Wright State University suspects. Biology professor Don Cipollini, Ph.D., director of the Environmental Sciences Ph.D. Program, has found that the invasive green beetle has apparently begun to attack white fringetree. "It appears that emerald ash borer is eating more than ash trees," Cipollini said. "It may have a wider host range than we ever thought in the first place, or it is adapting to utilize new hosts. This biological invasion is really something to worry about. It's having drastic ecological and economic consequences, and you can't always predict what's going to happen." Native to Asia, emerald ash borer was introduced to the United States near Detroit in 2002. It is believed to have been in ash wood used to stabilize crates during shipping. There are efforts to try to save ash trees from the borer. Pesticides can be injected into the trunk or poured into the soil around the tree and taken up by the roots. And there have been releases of parasitoid wasps, whose larvae kill the borer larvae. "But it's hard to stop this thing because the borer has reached such high densities," Cipollini said. "And it is now spreading to parts of the country where white fringetree grows." White fringetree, a relative of ash, is a deciduous shrub or small tree that can grow up to 30 feet tall. It has white flowers and a purple, olive-like fruit. It is known for its relative lack of pest and disease problems and has never been reported as a host to wood borers related to emerald ash borer. Cipollini, who has studied emerald ash borer for nearly 10 years, has been working with colleagues to come up with new strains of ash trees that would be resistant to the insect. With colleagues and students, he has co-authored seven publications on the insect, with several others in review or preparation. He discovered that borers were also attacking white fringetree in August when he acted on a hunch. Cipollini was examining some white fringetrees that had been planted by the Yellow Springs Tree Committee near his home in the southwestern Ohio village when he spotted a telltale borer exit hole with the characteristic "D" shape on one of the trees. "I walked up to the tree, saw the hole right in front of my eyes and said, 'Oh my gosh, there it is,'" he recalled. He got permission from the committee to peel back the bark, discovered what appeared to be the typical feeding gallery of emerald ash borer and determined that attacks on this tree had begun at least two years earlier. He later found similar infestations in another white fringetree in Yellow Springs, one at Cox Arboretum in Dayton and one at Ferncliff Cemetery in Springfield. Cipollini collected the larvae, took them back to his lab and put them under the microscope. The larvae were totally consistent with those of emerald ash borer – from the bifurcation of the pronotal groove to the abdominal segments becoming increasingly trapezoidal. "Based on the larval morphology alone, I'm confident that this will turn out to be emerald ash borer," he said. "There was a good paper that was published two years ago describing the physical characteristics of emerald ash borer larvae, and this meets those that I can determine. If it turns out not to be emerald ash borer, it has to be a close relative and likely non-native. And so it would still be a concern for the same reasons as emerald ash borer." Later Cipollini was able to exhume part of a dead adult beetle from the tree that failed to emerge two years ago. This specimen also exhibits key characteristics of adult emerald ash borer, he said. He then sent photos of the larvae and a larval specimen to experts at the Animal and Plant Health Inspection Service (APHIS), an arm of the U.S. Department of Agriculture. Cipollini was told the larvae in the photos appeared to match those of emerald ash borer. The same is being done with the adult specimen in order to confirm its identity. APHIS, which investigates invasive species that impact agriculture, horticulture and forestry, would be the agency that would quarantine white fringetree to try to control the spread of the borer. "Wild populations of this tree, along with horticultural specimens, are now seemingly under threat like ash trees are," Cipollini said. Cipollini quickly wrote up a short paper on his discovery and sent it to the Journal of Economic Entomology, one of the Entomological Society of America's main publications. The editor asked Cipollini to conduct DNA tests on the larvae to further confirm its identity, which he is currently doing. He also plans to rear additional adults from infested wood to confirm their physical characteristics. 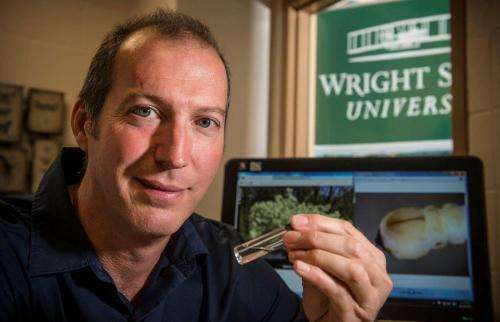 Cipollini is scheduled to present his findings to APHIS officials and researchers at an emerald ash borer research review meeting on the Wooster campus of The Ohio State University on Oct. 15. "I am grateful to be in a position at Wright State University that affords me the academic freedom to explore," he said. "If you have an interesting question and can find the appropriate resources, you can study it." Cipollini said that if the emerald ash borer destroys white fringetree, the birds, insects and other wildlife dependent on the tree's leaves and fruit may also be threatened. "It's one of these unexpected consequences of biological invasions," he said. "Even when you think you have a handle on something and you understand what it does and what it may cause, these kinds of surprises pop up." Cipollini said the threat to white fringetree is the latest example of the narrowing of the plant ecosystem, which provides humans with such things as fuel, water purification and erosion control. "It gets harder and harder for Mother Nature to handle that for us as you further and further reduce the pool of species that are present and their abundance," he said. Ash and White fringetree are both Oleaceae. Perhaps this attack may help pinpoint why the beetle finds these both trees attractive?